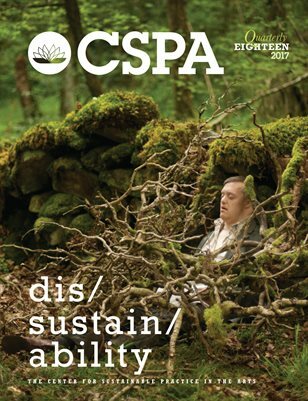 This CSPA special-themed issue offers a diverse array of artistic responses and critical means for interrogating the overlaps of sustainability and disability-- and the relevance of conjoining these concepts in/for today’s world. Drawing on practitioners and scholars from three continents – some self-identifying as ‘disabled’, others not – this issue grapples with the neologistic tensions, hurdles and gifts of our cultural, social, economic and environmental propensities towards and with notions of disability. With contributions from Petra Kuppers, Stephanie Heit, Dee Heddon, Sue Porter, Neil Marcus, Sandi Yi, Ray Jacobs, Julie Laffin, Jennifer Fink, and Bree Hadley. Guest Edited by Bronwyn Preece.